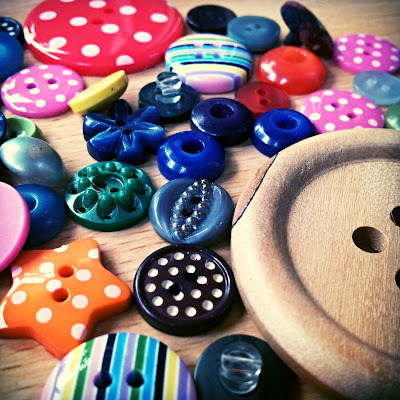 I don't like buttons... my son's strange phobia. Warning - this post contains a picture of buttons. Ever since my son was tiny, long before he could talk, he has disliked buttons. I have racked my brain trying to think of a bad button experience when he was small, but I can't. Nothing. I have no idea where it came from. Since he has been able to speak, we have known more about his aversion to buttons, "I don't like buttons" being regularly voiced. Initially myself and my husband were not allowed to wear them. He refused to cuddle or be near people who were wearing buttons. Once we were aware of the problem, we stopped wearing buttons, but there were some occasions when we couldn't help it, and the boy had to learn to deal with it. As a baby and toddler, we made sure any clothes we bought him didn't have buttons on and endeavoured not to wear buttons ourselves. When he started pre-school, his uniform was a polo shirt, which had buttons on it. We prepared him and he eventually got used to the idea. However, once he started, he preferred to leave his jumper on to cover the buttons up. This was fine in winter, but he ended up quite hot in the summer! His dislike of buttons has now reached the point where he is rude and doesn't play with friends if they are wearing clothes with buttons on. He was even rude to a doctor a few weeks back. When I asked him why, he said it was because she was wearing buttons. I don't really know what to do though. He will now wear them, as long as they are covered up. But he wears them grudgingly and wouldn't choose to wear a top with buttons on. Even coats have to have zips and not buttons. When asked, he says it is 'because I don't' like the feel of them'. I don't think that's the real answer though. He rarely wears them and given that he doesn't go near people who have them on, he very scarcely actually touches them. When I Googled button phobia, it apparently actually exists and is called Koumponophobia. It seems that he was born with some degree of button phobia as it has been there for as long as we can remember. It has changed our lives because I now think twice about buying clothes with buttons for any of us and I would never consider buying anything for him which has buttons on. I also have to think about what I wear each day, making sure that my outfit doesn't contain buttons. He is developing his own coping mechanisms, which is reassuring and helping him to behave better. He said that it is easier to deal with buttons if he sits quietly and thinks about them first. If he doesn't know someone is going to be wearing buttons, for example, the doctor, his behaviour is still rather variable. When family are visiting they often have to change their clothes and his behaviour improves instantly. His four year old friend always makes sure she doesn't wear clothes with buttons on when he is coming to play, because he refused point blank to play with her the last time she wore them. Aside from spiders, there is not a lot that I am really scared about, and nothing all that irrational, so I don't feel like I really understand his fear and I don't know how best to help him. If you have any experience of anything similar then I would love to hear your story.